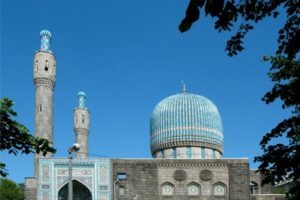 Islam is the second biggest religion in Russia. About 20% Russian people are Muslims. Besides, there are about 5,000 registered Muslim organizations in Russia. 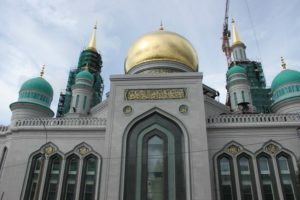 With such number of Muslims, Russia is a home for around 8,000 mosques and 9 of which are considered as the most beautiful. 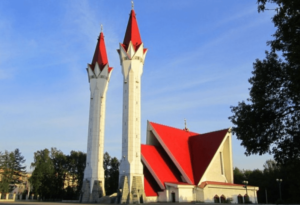 Here are 9 most beautiful mosque in Russia. 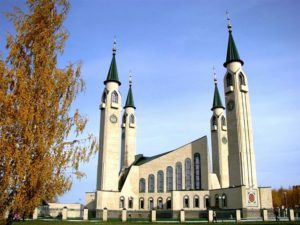 Russian Moslem built Maykop Cathedral Mosque in 2000. Soon, it becomes one of the most attractive place and is the main Muslim center in the Republic of Adygea. Besides, it has modest and beautiful design. Moreover, the mosque is open for tourist. People can also hold wedding ceremony in the mosque. 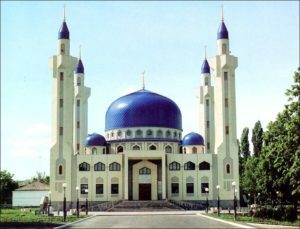 Russian Muslims built it 1996 in the evening, at the time of the 30th anniversary of Nizhnekamsk town. The building has four minarets and three of them are 66 meters high. Meanwhile, the other minaret is 5 meters higher. It is located at the central entrance. For your information, the mosques does not have dome like other mosques. The interior of the mosque includes 1000 m² of carpets. In addition, marble covers the walls and steps of the main staircase. Three prayer halls can accommodate more than 1,000 worshipers. Furthermore, the mosque is part of a complex. The complex consists of an Islamic-based school, a library and a hotel. Bulgar mosque is the only mosque in Russia which is painted in white. It is in a new part of Tatar capital, in Novo-Savinovsk district. Russian Muslims built it to commemorate the the 1100th year anniversary of the Islamisation of Volga-Bulgaria. Following the finished work, they opened the mosque for public in 1993. Architects Valeriy Voginov and Yevgeni Prokofiev built it in the beginning of 1990’s. Minaret of the mosques is 35 meters high. Moreover, it is the house of the largest Koran in the world. The Koran weights 800 kilograms and requires 16 people to lift it. Moscow Cathedral Mosque is in Olimpiysky Avenue. It is close to Olympic Stadium which is in the center of the city. Moreover, people also know it as Tatar Mosque. This is because its worshipers are mainly from Tatar ethnic. Muslims in Russia built it in 1904 based on design by architect Nikolay Zhukov. The mosque had since received several reconstructions. However, the major reconstruction began in 2011 as it was considered old. The new building can accommodate up to 10,000 people. It consists of multiple halls, a library, a museum and an exhibition space. People also know it as Akhmad Kadyrev mosque. The name derives from the late president and religious figure of Chechen Republic. It is on the picturesque bank of the Sunzha River in the middle of a huge park, around 14 hectares. It has classical Ottoman style. Its dome has 16 meters in diameter and is 32 meters high. Meanwhile, its four minarets are 62 meters high. Marble and travertine cover the exterior and interior walls of the mosque. Meanwhile, white marble decorates the interior. 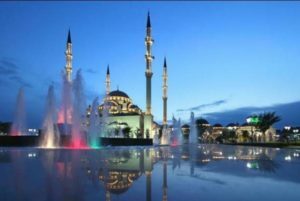 Chechen leader Ramzan Kadyrov and Russian Prime Minister Vladimir Putin opened the mosque for public in 2008. 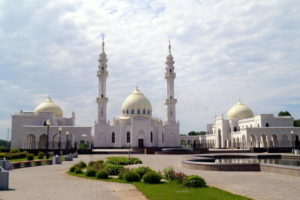 Lala Tulpan mosque is one of the largest mosque in Russia. It has modernist design. The word Lala Tulpan means Tulip in bloom. Wakil Davlyatshin built it between 1990 and 1998 in a modernist design. It has 53-meter high twin minarets that stand apart from the main building. 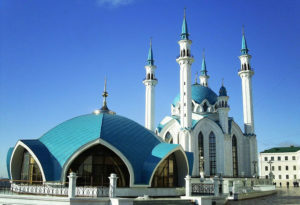 The Kul Sharif of Kazan has the most number of minarets in Russia. People chose the name to honor Kazan’s great last imam. It is the great symbol of Kazan and the Republic of Tatarstan. It is also part of the Kazan Kremlin Historic and Architectural Complex. During his invasion in 1547 until 1552, however, Ivan Grozny destroyed the mosque. The reconstruction of the mosque began in 1996 and ended in 2005. The work finished just in time for the 1000th anniversary of Kazan. The mosque is not a single building. 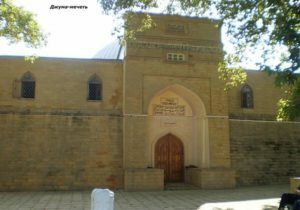 It consists of a mosque, a memorial stone and an administrative building. The complex is almost 19 thousand square meters wide. The Blue Mosque is in the Neva River delta in Saint Petersburg. People also know it as the Great Mosque of Saint Petersburg or Saint Petersburg mosque. However, people call it “Blue Mosque” as it has blue dome which looks like domes on top of mosques in Uzbekistan. Moreover, the blue color lights during the night. This adds to the beautiful view of the mosque. The mosque bulit in 1909 until 1920 by Architect Nikolai Vasilyev with engineer S. Krichinsky and the architect A. von Gauguin. It took seven years to work on the interior. The Juma Mosque is the oldest mosque in Russia. It is in Derbent, Dagestan. It was built between 733 and 734 AD. Besides, it is also listed in the UNESCO Cultural Heritage Register. As an ancient mosque it does only have one color and that is brown. It has 68 meters and 28 meters length from South to North. However, this mosque that still stands until today has bad history. During anti-religious campaign in 1930’s, religious objects were shut down. Unlike other religious objects, Juma Mosque was used as prison from 1938 until in 1943. Those are 9 most beautiful mosque in Russia. You may also want to check History of Muslim culture.